All pro-life activists and Missourians against the death penalty - Save the Date and join us in Jefferson City to lobby for a moratorium on the death penalty. 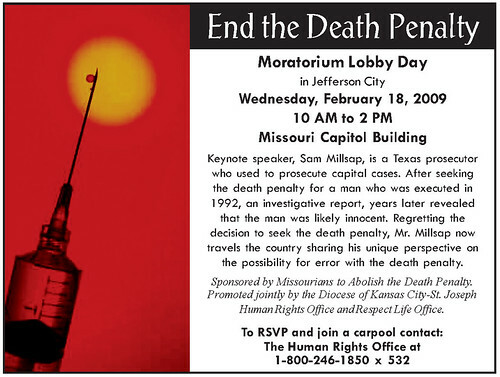 Sam Millsap, the former Texas prosecutor who sent the wrong guy to death and now tours the country opposing the death penalty will be there. The Philadelphia CityPaper has an interview with him here. Please see the official release from the Diocese of Kansas City - St. Joseph following the graphic. Accompanied by Sam Millsap, representatives from Moratorium Now!, Missouri Catholic Conference, and the American Civil Liberties Union will advocate for passage of the legislation. Millsap served for five years as Bexar County District Attorney, in Texas. Among defendants Millsap prosecuted was Ruben Cantu, executed in a capital murder case in 1992. Following a 2005 investigation by the Houston Chronicle, considerable doubts arose about Cantu’s guilt. Millsap acknowledges that he erred in seeking the death penalty on the basis of testimony by a single eyewitness. He has assumed personal responsibility for Cantu’s execution. Millsap campaigns against the death penalty throughout the United States. Coalition partners believe that the state must protect its citizens and discipline those who commit serious crimes. Jude Huntz, Director of Human Rights for the Catholic Diocese of Kansas City ~ St. Joseph, pointed to concerns about how best to do this. Missouri resumed the death penalty in 1989. Since that time, the state has put to death 66 inmates and currently ranks fifth in the nation in the rate of executions by population. In September 2008, the Missouri Supreme Court issued a stay of execution to John Middleton to hear oral arguments on the validity of Missouri’s lethal injection procedures. (John C. Middleton v. Department of Corrections, et al. SC89571 pending).